Hoodening is an East Kent winter custom dating back many centuries. In its current form, a small band of villagers spend around four days before Christmas touring local pubs and private parties, performing a humorous play along the theme of death and resurrection, drinking a lot of beer, and collecting some money for charity. A new play is written each year in rhyming couplets by one of the troupe, and references to recent events (local, national and international) are frequently included, although the setting is based on a ploughing team from the 19th Century. Over the last few years numerous other 'Hoodening' groups have also appeared in Kent. Most of these appear to be derived from Morris teams; some focus on singing, others on theatre (the scripts are often quite similar to Mumming plays, and tend not to change much from year to year). 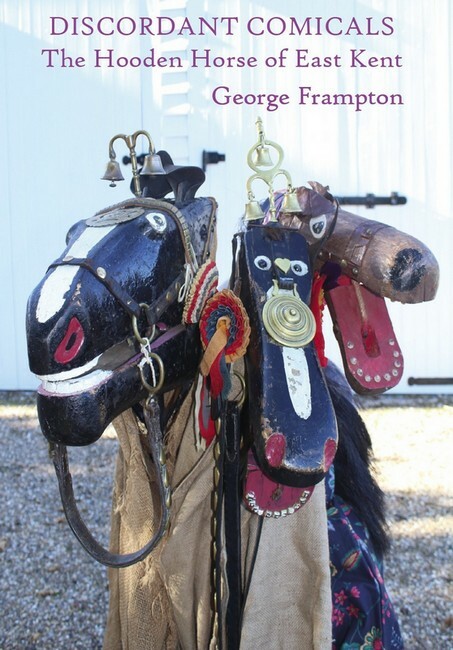 Although this website does contain a lot of information on Hoodeners, more can be found in George Frampton's 2018 hardback book "Discordant Comicals: The Hooden Horse of East Kent", published by Thanet imprint Ozaru Books. There used to be groups all around East Kent, but at the beginning of the 20th Century only a few were left, including one based at Nether Hale and another in Sarre (both near St Nicholas at Wade). There were various differences from Hoodening as it is now — for example, they did not announce when they would visit a house (but people knew it was likely to happen sometime in the week before Christmas), they collected money for themselves rather than for charity, and instead of performing a play with a script they fooled around (the Jockey tried to ride the Horse, but was normally thrown off; sometimes the 'audience' tried too, but with similar results) and sang popular songs of the period. The team took a breather in around 1921 and stabled their horse in an attic, until it reappeared in 1965 and the custom restarted. It appears that six original Hooden Horses have survived, of which only the two in St Nicholas are in use — the others are mainly in museums (see links in menu). Dobbin. Tends to be seen as a 'poor old horse' exhausted by the hard labour forced on him by the Boss. In recent years occasionally accompanied by up to two other horses (with varying names). Was Joe and 'arry, now Bill. Wears a top hat, carries a whip and keeps the others in line. A woman (played by a man) past her prime. Carries a broom (and used to use it to sweep the feet of those just inside the door). A soft heart (and head). Farm labourer. Lazy, mean and smelly. Has gone by other names too, e.g. Allan. Sometimes tries to ride the horse — with varying degrees of success (depending on the age of the horse)! Young and reckless. George (and previously Adam). Quite stupid, but helps everyone sing the carols at the end. It looks as though he wears pyjamas made from curtains, but this is an authentic costume copied from an old photograph! 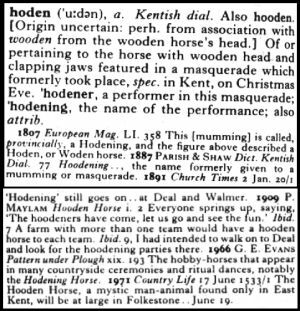 There is no clear etymology for the words 'hooden' or 'hoodening'. The Oxford English Dictionary entry is quite brief, but other theories include 'hooded', 'hide' (as in animal skin — or as in concealment) and 'hoaden' (a type of cloth): all of which should be self-explanatory. One book claims it may be from 'hodden', a dialect form of 'holden', meaning 'held' as in a sacred object to be guarded for a symbolic annual sacrifice… hmmm. Another suggested derivation is 'Robin Hood', as he was a key figure in Mumming plays throughout history, accompanied by Maid Marian = Mollie. Finally, there is a chance that it may have come from 'Woden' (the Norse god), as he had a famous horse and this has evidently influenced the similar custom of the Schimmelreiter. It is unlikely we will ever know much more than this.